Exchange server is a centralized unit that contains emails, contacts, shared folders and many more user database necessary for communication in collaboration with Outlook and POP3 websites. 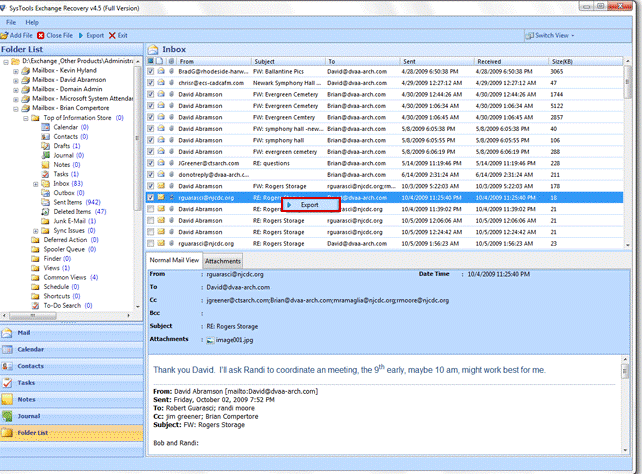 Once Exchange – Outlook environment is established then you will receive emails in Outlook user account and it gives the access of emails in your desktop even being away from Exchange connection. But what if you are away from your machine? – Thankfully, through the Outlook Web Access facility user can access emails and other data in Exchange server anytime from any web browser. 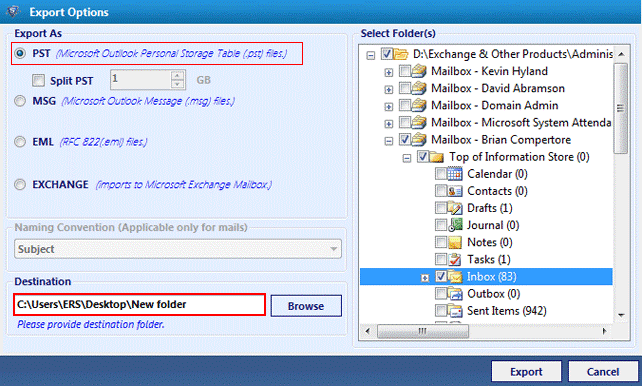 This is the instant method to access mailbox data till user is part of the Exchange- Outlook environment, but once detached from it there is no way to access those mailbox data. So, in order to keep the track of data that you saved for a life time in Exchange server, it is always suggested to carry the Exchange EDB mailbox data converted in PST format so that whenever and where ever you travel your data will be available just a click away from import it to Outlook. Resolve EDB Mailbox Corruption: EDB mailbox corruption issues are common trouble that force user to get Exchange Recovery like third party software solutions because the inbuilt applications with Exchange server such as ExMerge utility, Eseutil.exe and Isinteg.exe etc fail to resolve most of the corruption issues if the ratio of corruption reported is high. Both logical and physical corruption issues in turn harm the normal accessing of Exchange mailbox data and in this case the best solution is to run SysTools® Exchange Recovery software and recover EDB to healthy format or selected file type. Transfer Exchange EDB to New Server Version- Exchange server is been updated time to time by Microsoft® for the improvised user experience and hence the latest edition Exchange 2010 version is here with much user friendly attributes and several options to manage the mailbox data in a much systematic way. 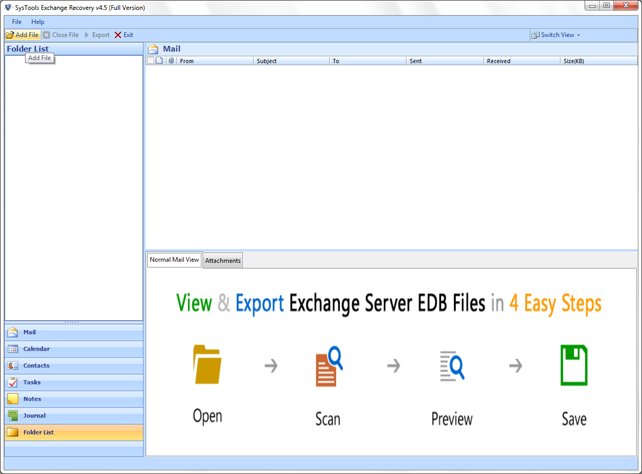 To transfer EDB mailbox from the existing server version say Exchange 2007 or 2003, user can get the help of Exchange Recovery software as it provide provision for the easy conversion of EDB mailbox data to Exchange server mailbox data even when the EDB is inaccessible/corrupted or damaged. What User Can Acquire By Working with SysTools® Exchange Recovery Tool? SysTools® Exchange Recovery software can be an all-rounder solution for many issues that surrounds EDB mailbox database. Tool successfully resolves EDB corruption issues, EDB mount/unmount troubles, EDB migration needs, Exchange server downtime leading to EDB file inaccessibility, change in work environment from Exchange- Outlook to non Exchange, and demand to access EDB data under different email platforms like Outlook Express, Windows Live Mail, Outlook, Thunderbird etc as software brings the option to scan, recover and convert EDB mailbox data to PST, Exchange EDB server database, EML and MSG formats. 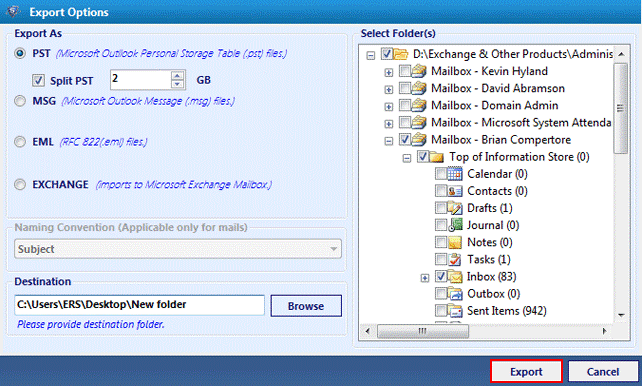 Single/batch conversion of EDB mailbox to PST, EML, MSG or Exchange server database. From priv.stm and pub.stm media files can be extracted. Emails, email attachment, contacts, Task and all other data can be recovered. Deleted, compressed and encrypted mailbox data also can be recovered. Large/small, corrupted/healthy, inaccessible/damaged EDB file can be recovered. Email metadata retained even after bulk migration carried out. EDB mailbox migration process report saved as CSV. What is New in SysTools® Exchange Recovery Version 4.5? With the release of version 4.5, SysTools® Exchange Recovery tool have become the feature rich solution to approach any kind of database migration or recovery related issues under Exchange- Outlook environment. Option to split PST if PST file exceeds size limit. 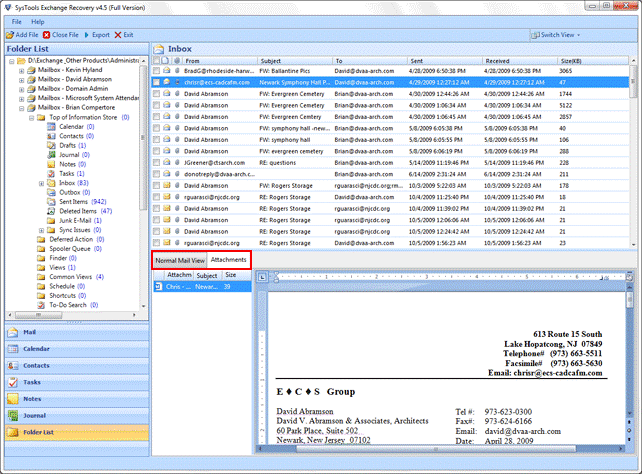 Convert EDB to EML or MSG format with naming convention to for easy management. 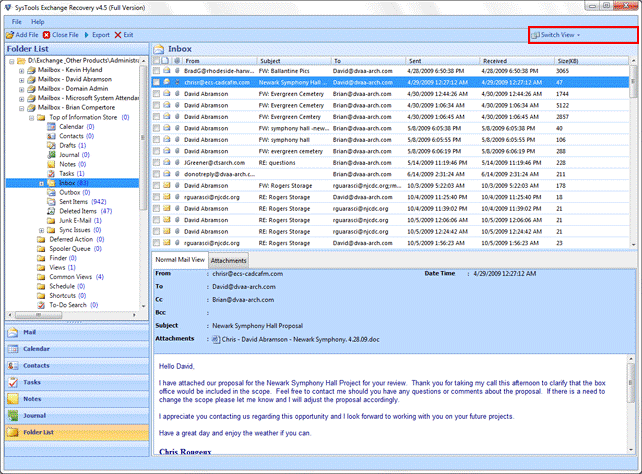 Advance scanning option for accurate Exchange server mailbox recovery. Rich algorithm to detect STM file automatically for lower version of EDB files and if it is in different location then file browse and locate facility is activated. For EDB to Outlook 2013 conversion, extended support to Outlook 2013 version also. Provision to preview email body as well as email attachment of file formats like PDF, DOCX/DOC, PPT/PPTX, image formats etc. As a trial run user can work with the free version of SysTools® Exchange Recovery software that can affirm the confidence of working with purchased version of the software. Free version is activated to work exactly like the full version allowing user to export 25 items per EDB folder to be desired file format for free. Try the demo first and then get the full version purchased with added confidence of experience in EDB mailbox recovery process. MS Outlook (any version) Installation is necessary. First Screen – The software interface looks similar to that of MS Outlook, so the first screen itself will give the confidence of easy process execution of EDB recovery. 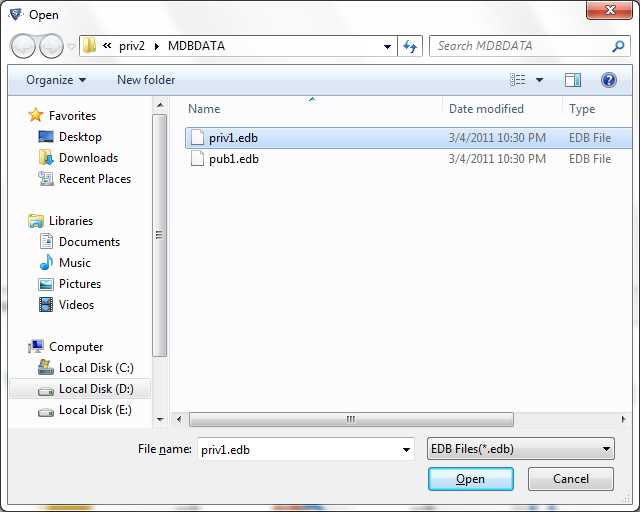 Browse EDB- EDB file can be browsed and located on any Win OS that run the tool. Attachment View: Email attachment can be previewed. Horizontal View: Get the email content displayed horizontally. Vertical View: Vertically view the email body and attachment content. Export Mailbox- Select particular email from the preview list and right click to export it. Select PST- If user select PST file option to convert EDB file then the option to Split PST will also be activated. Select EML or MSG – By selecting the option to export EDB as EML or MSG user get the facility to name the file accordingly before saving it. Select Exchange- To import EDB to Exchange mailbox data, select Exchange option and validate the conversion giving an Exchange mailbox name. 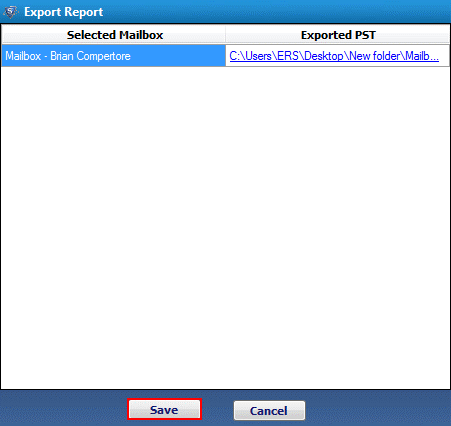 Export Report- Once the process of Exchange mailbox conversion is carried out successfully into the desired file format, get the process report. Click Save to retain report in CSV format for future reference. Note: If user select the option to export EDB to Exchange mailbox, then there are further steps need to be concluded, which is in the CHM file attached with the tool. Conclusion: SysTools Exchange EDB Recovery version 4.5 serves as best option to face the EDB file corruption or migration situations, even when the default solution fails to perform it. With an investment of just $299, one can resolve the Exchange mailbox related troubles and get the database in the format they desire among the options as Outlook PST, EML, MSG or Exchange mailbox data. Tagged SysTools, SysTools Exchange Recovery. Bookmark the permalink.